Do you have an herb garden or grow herbs on your windowsill? 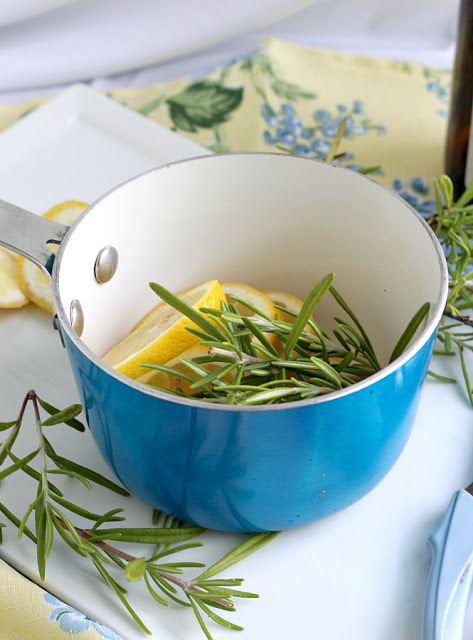 Do you have a favorite herb for cooking? I have a smallish, 4-foot by 8-foot raised bed where I grow herbs and some annuals. Just the ones I use most often in the kitchen. 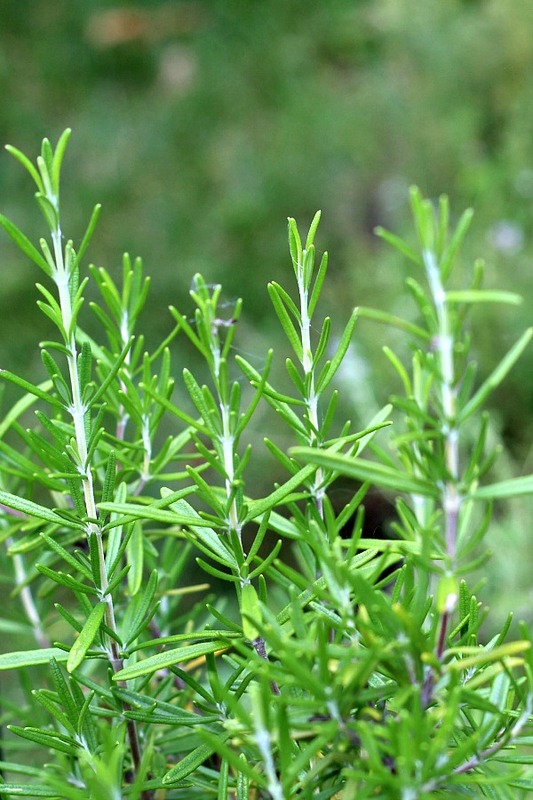 The aromatic evergreen, rosemary, does really well needing little attention. 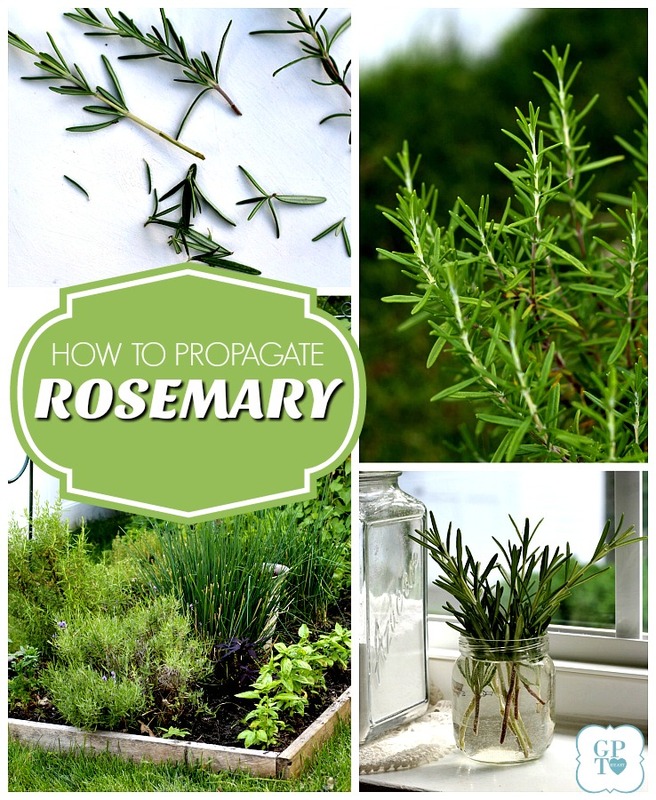 This perennial herb is super easy to propagate from stem cuttings to make more plants. 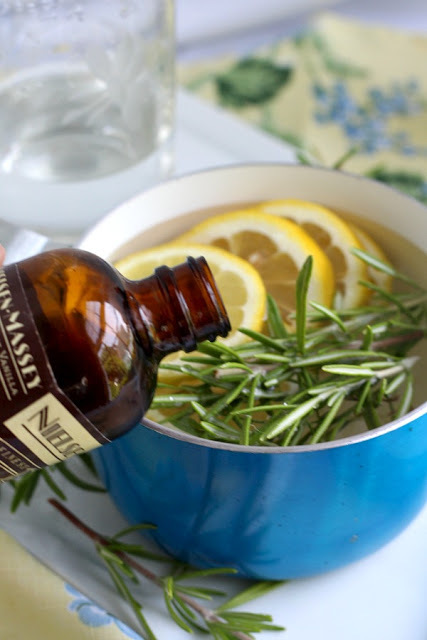 Rosemary infuses lots of flavor in cooking but it also is a lovely ingredient in this light and clean-smelling, simmering potpourri. There are many occasions that cause less-than pleasant odors in our home. 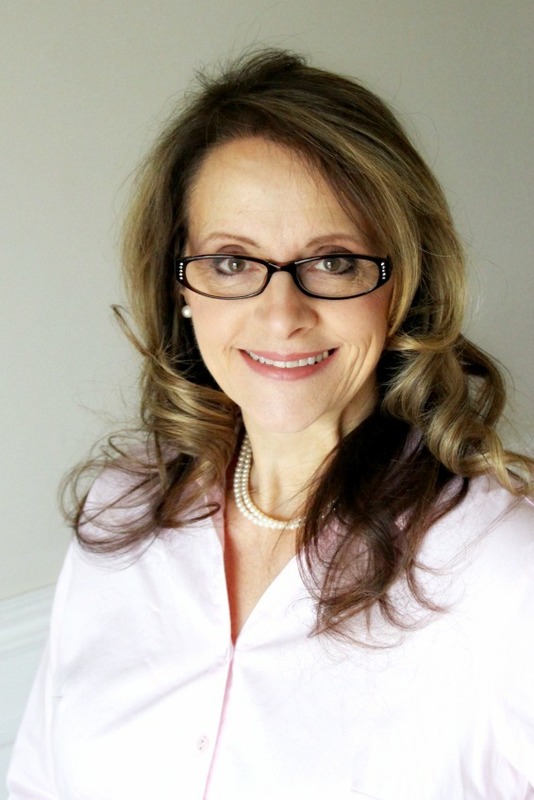 Strong cooking aromas or a couple of grandbabies with stinky diapers quickly come to mind. I might light a candle or use grab a can of spray but I found a better solution. Just a few natural ingredients in a small pot filled with water and soon we can all breathe easy again. The first time I made this potpourri and watched as it gently simmering on the stove, the fragrance waifed through the kitchen. Then I wondered if the scent was noticeable throughout the house. I got my answer from two unlikely sources. I stepped outside and back into the house a few times, sniffing the air. Just then, my grandson came traipsing down the steps exclaiming, as only a 20 year-old guy would, “I smell something that smells like something.” I asked him if he thought it pleasant or unpleasant. This scent-sensitive fellow gave it a thumbs up and did not think it overpowering. 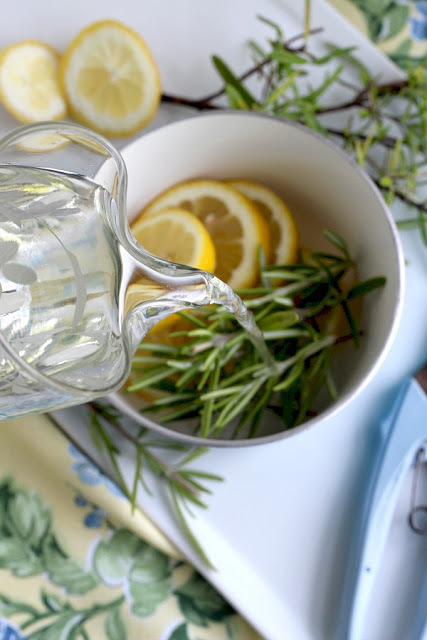 I love that a few simple ingredients simmering in water can freshen the air and that it is natural containing no unpronounceable chemicals. To make the Lemon and Rosemary Simmering Potpourri, slice a lemon and snip two or three sprigs of fresh rosemary. 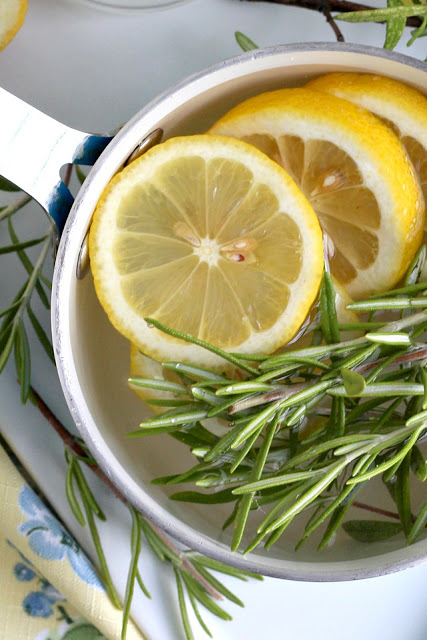 Put the lemon slices and rosemary into a small pot. 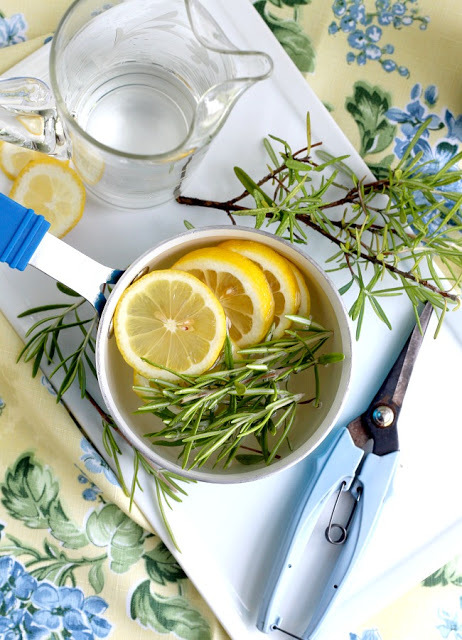 My pot is pretty small so if you’d like, double the lemon and rosemary to make a large amount in a bigger pot. Pour water into the pot and fill to about 1-inch from the rim. Add a splash of vanilla. One half to one teaspoon is good. 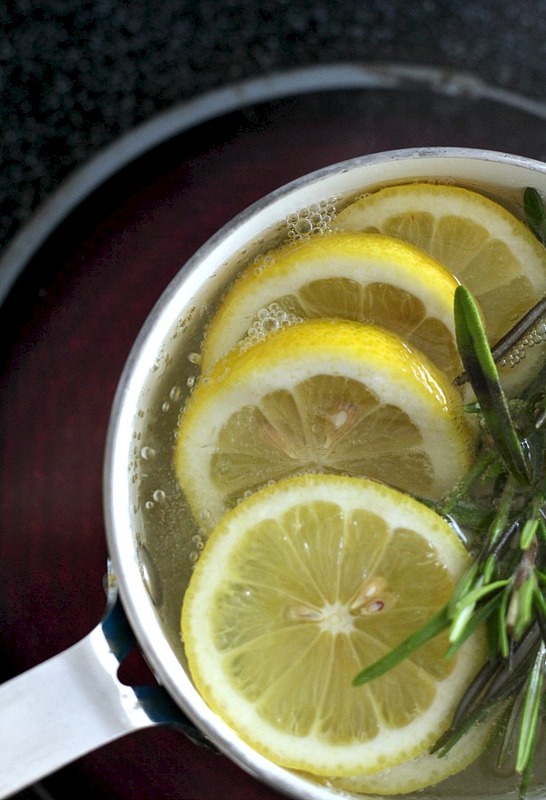 If you’d like, toss in a cinnamon stick for a slightly different scent. Heat on medium-high temperature just until the liquid begins to simmer; lower heat and allow to simmer. Replenish the water as it evaporates. keeping an eye on it to be sure it doesn’t cook dry. That’s it! 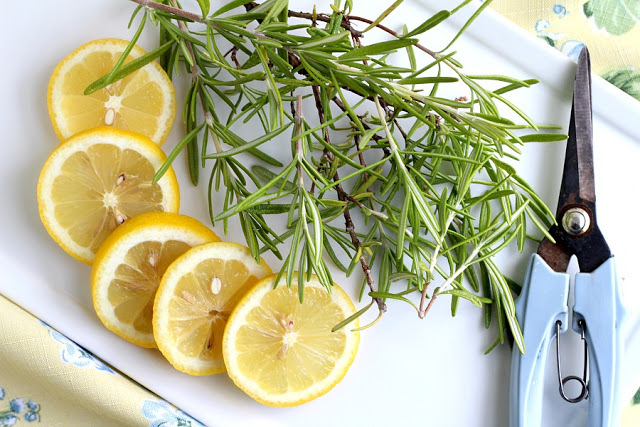 A lovely citrus scent filling your home. 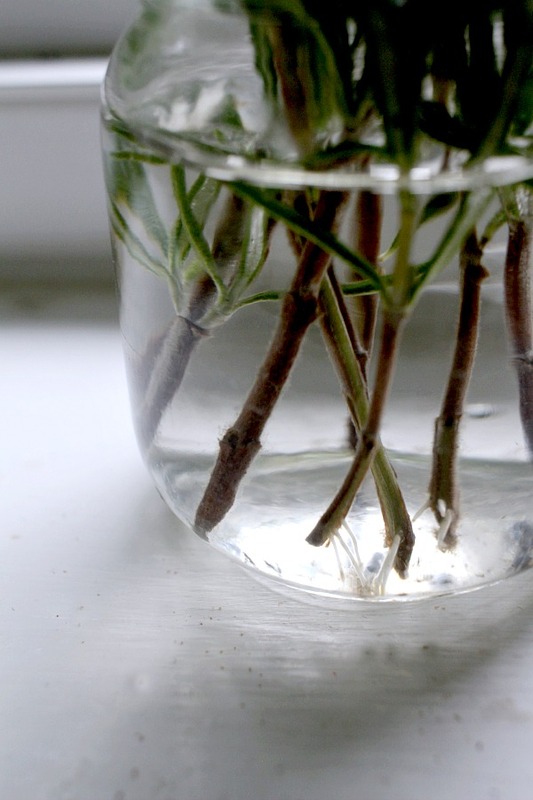 It is easy to create additional rosemary plants from stem cuttings. 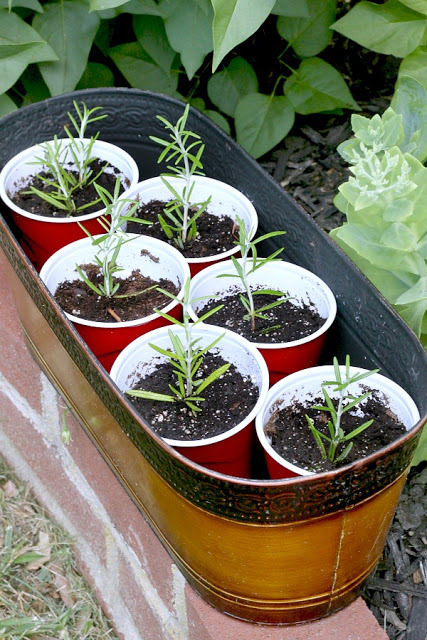 When rooted, plant rosemary in the garden or pot up and share with friends. A gift of a living plant is usually a welcomed one especially one that can be grown on a sunny windowsill and close by when cooking. The botanical name for rosemary is Rosmarinus officinalis. It is a woody, perennial herb with fragrant, evergreen, needle-like leaves. Native to the Mediterranean region, rosemary is a member of the mint family. Did you know rosemary has square stems? Plants characterized by square stems are part of the mint family and include herbs, flowers and small shrubs, and usually have opposite leaves, tiny flowers and strong scent. Rosemary plant care is easy. The plants like well-drained, sandy soil and at least six to eight hours of sunlight each day. These plants thrive in warm, humid environments and usually cannot withstand winters below 30 F. Luckily, I have had my plants survive our south Jersey snowy, cold winters quite well. If you prefer, put them in containers, which can be placed in ground and easily moved indoors during winter. Roots should appear in 3-4 weeks. Pot up the stem cuttings once roots develop. Looking closely, you can see tiny roots developing on the rosemary cuttings. This is just a week and a half after taking the cuttings and placing in water. When they have a little more roots, I will pot them in soil. I can almost smell the heavenly scent coming from your home. I am going to try this today! I love a good-smelling house! Thank you so much for this recipe! I have a little bush "rozemarijn" in my garden. And I have lemons in the fridge. Vanilla I have to buy. I want to try this in summer vacation.